A successful 26.5% share for IFTA late night broadcast on RTÉ closing off the high-powered Saturday night entertainment viewing that starts with TV3’s very popular Ireland’s got Talent show which received a 21% share on Saturday 17th February. 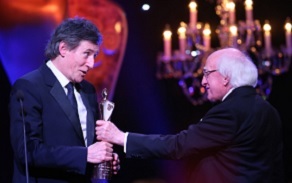 Despite the late night TV slot for IFTA, almost 270,000 Irish people tuned in to see the Deirdre O'Kane deliver a super-charged opening monologue that had the IFTA Ceremony audience in stitches, IFTA Nominees and leading Irish screen talent alongside guest of honour President Michael D Higgins, Gabriel Byrne, Minister Madigan, Minister Zappone, RTÉ Director General Dee Forbes and IFTA CEO Áine Moriarty. Deirdre got straight to the heart of gender equality and said the Irish Film Board are aiming for 50/50 gender parity. “We know that the men will be 50... but the women will still be in their 20s and Naked. She applauded the men in the room for choosing to wear black in solidarity and said that in fairness, the black does cover a multitude of sins saying “ Jaysus lads, the clergy got some things right”. Winners of the coveted IFTA Awards included Frank Berry’s superb film ‘Michael Inside’ which won Best Film; John Connors who won Best Actor for ‘Cardboard Gangsters’ received a standing ovation for his honest, passionate and controversial acceptance speech which has already received over 90,000 views on IFTA’s facebook channel, can be seen here. Other winners on the night were Aisling Walsh won for Best Director Film for ‘Maudie’ (which also won Best International Actor for Ethan Hawke and Production Design for John Hand), and Dearbhla Walsh, who won Best Director Drama, for Fargo. Deirdre jokingly said there’s a big difference between a male and female IFTA winner saying that “Tom Vaughan Lawlor gets to go to LA to shoot a Marvel blockbuster with a Hemsworth brother and an Olsen sister, while I get to go to Bray to dance with Nathan Carter’s brother and Conor McGregor’s sister!" Other winners on the night were Saoirse Ronan, Barry Keoghan, Liam Cunningham, Caitriona Balfe, Victoria Smurfit, Charlie murphy, won the Lead Actress Drama IFTA for her performance in the hugely popular show ‘Outlander’. In her Monologue, Deirdre finished by saying she decided to wear black not just in solidarity with the #TIMESUP movement but to honour the legendary Irish actress Maureen O'Hara, who received the IFTA Lifetime Achievement Award in 2004. She said "Maureen had the talent, the smarts and the tenacity to make it", but "she encountered harassment on a daily basis as she just tried to do her job". "It’s got so bad... I hate to come to work in the morning… because I don’t allow the producers and directors to kiss and paw me, I am a helpless victim of a Hollywood whispering campaign… If that is their idea of being a woman, I am ready to quit Hollywood now." The ceremony highlights are available on the RTE Player. The broadcast was produced by Jane Wardrop and Exec Produced by Stuart Switzer of Coco Television for IFTA and RTÉ, and directed by Alan Burns.